This is a Robin Hood Short Story. Long ago, in England was ruled by a wicked, greedy Prince John. He ordered the Sheriff Nottingham to tax the people so heavily that some were forced to become outlaws. Two of the most famous outlaws were Robin Hood and Little John, who would steal the tax money from the Sheriff and give it back to the poor. One day Prince John was traveling by coach to Nottingham to pick up more tax money. He was so busy counting his gold that he didn’t notice he was passing through Sherwood Forest, the home of Robin Hood nor did he see that Little John and Robin Hood were watching him from the tree. Also, read Peter Pan Story. “Look at all that gold, Hey Little John, let’s pay Prince John a little visit!”, said Robin Hood. In his coach, Prince John was talking to his counselor, Sir Hiss, about his favorite subject, Gold. “Life has become so wonderful since King Richard left for the Crusades. He treated the people too nicely and he missed out on all this lovely gold,” said Prince John. Robin Hood and Little John were standing by the roadside disguised as lady fortune tellers when the coach passed by. Prince John ordered to stop the coach. While Robin Hood told Price John’s fortune, he slipped the royal rings off his fingers, and Little John helped himself to the Prince’s gold. Prince John never ever knew he had been robbed until Robin and Little John escaped. Also, read Jack And The Beanstalk Story. Meanwhile, the Sheriff of Nottingham was busy collecting taxes. He even took the coin that Mrs. Bunny had given her son, Skippy, for his birthday. The Sheriff had no heart. Robin Hood didn’t think little Skippy should go without presents on his birthday, so he gave his bow and arrow and his big hat as a gift. The first time Skippy tried the bow, his arrow flew over Prince John’s castle wall. On the other side, he saw Maid Marian and Lady Kluck. Even though Marian was related to Prince John, she saw Robin’s friend. Long ago, they had been childhood sweethearts. One day, Robin’s friend Friar Tuck, came to Sherwood Forest with some news. “Prince John is having an archery tomorrow. Maid Marian will kiss the winner.” Everyone knew that Robin Hood was the best archer in all of England. The next day two strangers appeared at the tournament, a Stork, and a Duke. “Nobody will recognize us in these disguises. I will win the tournament and the kiss, but no one will know the winner is Robin Hood,” said Robin Hood. Also, read Pinocchio Story. Soon the Stork and the Sheriff were the only ones left in the contest. And even though Sheriff tried to cheat by having the target moved, the Stork made an amazing move and won. Prince John watched very closely. Robin Hood came to claim his prize but Prince John ordered his guards to seize him and gave him immediate death. But suddenly, Little John grabbed Prince John and told him to free Robin Hood. Once Robin was free, a big fight began. Robin and Little John fought off the guards bravely. Swords clashed and the arrows flew! Maid Marian was almost seized by the guards but Robin somehow rescued her. He and his friends escaped into woods. Safely back in Sherwood Forest, all of them celebrated and Little John sang a song making fun of Prince John. It was so funny that soon all of Nottingham was singing it. On hearing it, Prince John became very angry and commanded to double the taxes. But of course, nobody could pay and the prisons were full. The Sheriff even robbed the church and arrested Friar for objecting. When Prince John heard that Friar Tuck was in jail, he planned a new trap for Robin Hood. “We’ll hang Friar in the morning and when Robin comes to the rescue, we’ll have him,” said Prince John. 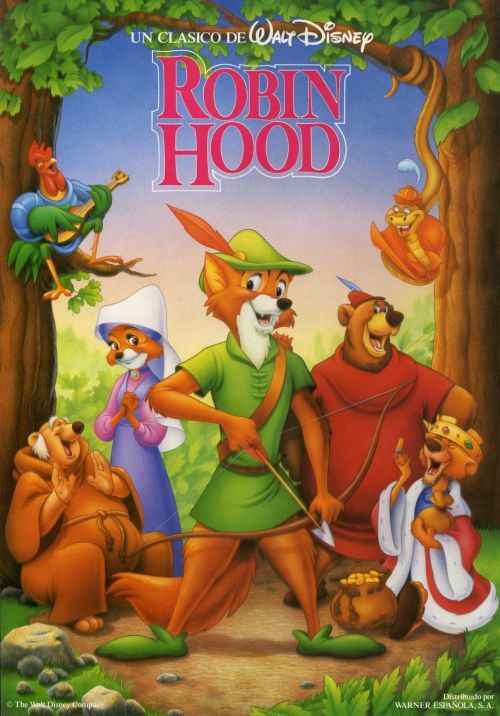 But Robin Hood was a foxy fellow and he was dressed up like a guard. He and Little John climbed the high castle wall and carefully stole the jail keys from the Sheriff who was sleeping. Everyone was surprised to see familiar faces and cried with joy. Also, read King Bruce And The Spider Story. Meanwhile, Robin had climbed up into Prince John’s bedroom, where all the gold was kept. Prince John and Sir Hiss were sound asleep. Robin tied the bags of gold to a rope between the bedroom window and the jail. Suddenly Prince John awoke and saw there was no gold left. The courtyard became a jumble of arrows, guards and fleeing prisoners. When Robin’s hat bobbed to the surface of the moat, Prince John was overjoyed and thought that he was dead. But, Robin had escaped by diving in the moat. Even Little John thought that Robin had drowned. But suddenly, Little John saw Robin and was overjoyed. Soon after Robin’s narrow escape, good King Richard narrow came back from the Crusades to take his place on the throne of England. Happiness returned to the land. Robin Hood and Maid Marian were married and all their friends came to wish them all. Also, read King Midas And The Golden Touch.